Serena Williams talks to the chair umpire Eva Asderaki. FEELING WRONGED AGAIN at the US Open, Serena Williams couldn’t let it go. Problem was, the real trouble for Williams was standing on the other side of the court. Sam Stosur pushed the 13-time Grand Slam champion all over Arthur Ashe Stadium last night and took what she wanted, along with what the umpire gave her, winning the US Open in a result that was as surprising for who won as how lopsided it was. The ninth-seeded Australian won her first Grand Slam title with a 6-2, 6-3 dismantling of No 28 Williams, the three-time US Open champion who hadn’t lost a set en route to the final. She lost two quick ones to Stosur. And, for the second time in three years, Williams did not leave Flushing Meadows quietly. This time, the drama began when Williams, down a set and facing break point in the first game of the second, flushed a forehand deep to Stosur’s backhand side and screamed out ‘C’mon!’ — figuring she had hit a shot that Stosur wouldn’t reach. But Stosur stretched out and got a racket on the ball and the umpire, Eva Asderaki, called Williams for a hindrance, awarding the point, and thus the game, to Stosur. What followed was nowhere near as menacing as 2009, when Williams berated and brandished her racket at a referee who called a foot fault in her semifinal against Kim Clijsters. The fans, sitting on their hands as they watched an unexpected first-set flattening of the American, got riled up and so did Williams, breaking Stosur’s serve on the next game, then holding her own serve for a 2-1 lead. But on the next changeover, Williams took things up again with Asderaki and she made it personal. And as quickly as she had gained the momentum and the support of the crowd, they were gone, leaving Williams to explain and deflect — and wait to hear if there will be further consequences. Asderaki issued a code violation warning for verbal abuse and the US Tennis Association said officials would decide today whether Williams would be fined. What she’ll also see, if she watches long enough, is a rare example of a player who doesn’t feel beaten before she even walks onto the court against Williams. That’s Stosur, a one-time doubles specialist, who has revamped her game over the past several years and moved her way into the top 10 in singles. Williams, who made this run after missing the better part of a year with injuries stemming from the night last summer when she stepped on broken glass in a restaurant, has had her shining moments at the U.S. Open. She won in 1999, 2002 and 2008. But she has an equal penchant for memorable losses. In 2004, a poor call during her quarterfinal loss to Jennifer Capriati was cited as a main reason for the introduction of replay technology in tennis. Then the Clijsters match. Now this. Email “Serena loses temper and US Open to Stosur ”. 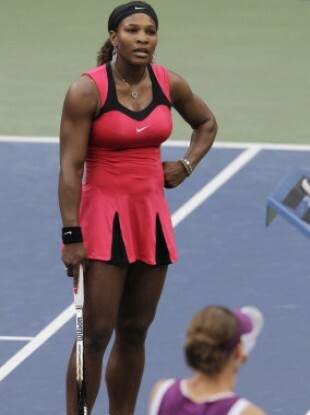 Feedback on “Serena loses temper and US Open to Stosur ”.